2015 KTM 125 EXC SixDays. Picture credits - KTM. Submit more pictures. 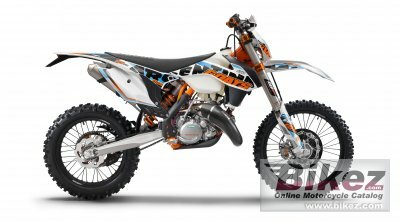 The 125 EXC Six Days is �READY TO RACE � for the world�s largest enduro competition, the �International Six Days Enduro�. Six days in succession, over a thousand offroad kilometres, 40 hours in the saddle - a gruelling test, not only for the rider. A whole package of high-quality special options makes the KTM 125 EXC Six Days fit for this ruthless contest, in which more than half the starters bank on KTM every year. Ask questions Join the 15 KTM 125 EXC SixDays discussion group or the general KTM discussion group. Bikez.com has a discussion group for every motorcycle. Here you may find answers to common questions about the model. If you do not find what you are looking for, you can ask questions. Try out the 2015 KTM 125 EXC SixDays discussion forum. You can sign up for e-mail notifications when other users answer you. If you have information about any technical issue related to this motorcycle, please leave a comment for other riders.